This offer is only available to residents of the British Isles. Alternatively, read our web pages printed below. Odinism is the name we give to the original, indigenous form of heathen religion practised by our forefathers, the Angles, Saxons and Jutes, and by the related Teutonic peoples of the Continent. It is, accordingly, the ancestral, native religion of the English people, and, as such, our very own spiritual heritage. Odinism is an ancient religion whose origins are lost in the mists of time, but it has been restored in recent decades by those who believe it offers a solution to modern Man's spiritual crisis. WHAT DO YOU MEAN BY A 'HEATHEN RELIGION'? The terms 'heathen' and 'pagan' are synonymous and interchangeable, and refer to any of those religions practised in the earliest phases of a nation's or people's history. One feature common to all the earliest forms of religion known to Man is polytheism, the belief in many gods and goddesses. The ancient, heathen or 'natural' religions can be contrasted with the 'prophetic' or 'revealed' religions founded, at a much later period, by individual teachers such as Moses, Buddha, Confucius, Jesus or Mohammed. WHAT ABOUT OTHER KINDS OF PAGANISM? All the peoples of ancient times were pagan: the ancient Greeks and Romans, the ancient Egyptians and Babylonians, as well as the ancient Teutons, Celts and Slavs. The polytheistic Hindu and Shinto faiths of India and Japan, respectively, are forms of heathenism which have survived into modern times. So too are the animist religions of sub-Saharan Africa. Paganism is therefore, in one sense, the only universal form of religion known to Man, and Odinism is but one branch of the heathen family of religions: that practised by the Teutonic peoples. The Teutonic or Germanic peoples comprise a number of nations and tribes of northern Europe, possessing a common origin and sharing many cultural affinities, who speak one or other of the Germanic languages. Their modern representatives include the Germans, Dutch, Flemings, Danes, Swedes, Norwegians and Icelanders, as well as the Anglo-Saxons of England and lowland Scotland - and all their descendants in the New World. Among important Germanic tribes of ancient times we can number the Ostrogoths, Visigoths, Lombards, Franks, Burgundians and Vandals. All of these nations were originally worshippers of the gods and goddesses of the Odinic pantheon. WHAT KIND OF RELIGION IS ODINISM? Odinism is a life-affirming religion. Odinists value and esteem everything that sustains, promotes, enhances and enriches life. Odinists do not see our life on Earth as merely being a preparation for a life hereafter. We see it as an end in itself, as something positive, good and hallowed. We rejoice in and celebrate all that is wonderful in the world around us: the fruitfulness of Nature, the changing seasons, the comforts of family and home, human creativity, and our personal and collective achievements. Odinists do not indulge in fasting and penitence; rather, we worship the gods in our feasting and merry-making. WHAT OF THE GODS AND GODDESSES? Odinism is a polytheistic religion. We believe in and honour the life-giving and bountiful gods and goddesses of the Odinic pantheon, whom we refer to collectively as the High Gods of Asgarth, or as the Æsir and Vanir. Our gods are true gods, divine, living, spiritual entities, endowed with power and intelligence, able and willing to intervene in the course of Nature and of human lives. It behoves us to seek their goodwill and succour through prayer and sacrifice. But the gods do not require us to abase and humble ourselves; they do not seek to make of us craven slaves. Odinists therefore do not bow or kneel or kow-tow to the gods, but address them proudly like free, upstanding men and women. Odinists regard our gods, not as our masters, but as firm friends and powerful allies. ... AND OF THE HUMAN SPIRIT? Odinism is a spiritual religion. Whilst we do not denigrate or despise the material aspects of human nature and of the world in which we live, we recognise that Man's essence is spiritual. Man is endowed with a soul or spirit, which contains a spark of the divine, and which is his imperishable and eternal Self. Its destiny is to be reunited with the ancestors, abiding for ever in the halls of the gods. Odinist teachings seek to achieve a balance between the material and the spiritual, neither condemning the former, nor denying the latter, for both are god-given elements of human life. Odinism is a nature-loving religion. Odinists revere, love and honour Nature, viewing it as a true manifestation of the spiritual. Our gods are Nature gods, expressing true concern for and, indeed, identifying themselves with its aspects and elements: Odin with the wind and air, Frigg with the land and earth, Thor with thunder and lightning, Niord with the sea and waves, and so forth. Odinists believe that all living beings are, in some degree, possessed of a spiritual essence; and by 'living beings' we understand not only beasts and plants, but mountains, rocks, seas, rivers, islands, all of which can be apprehended, like the Earth herself, as living entities, endowed with spirit. ... AND OF ODINIST COSMOLOGY? Odinism is a cosmic religion. Odinists do not subscribe to a simplistic dichotomy of 'Heaven and Earth'. Odinist mythology explains to us that, just as there are many gods, there are also many 'worlds', that is to say, many planes of existence, or dimensions of reality, interconnected, overlapping and inextricably enmeshed one with another. The myths describe this phenomenon as the 'Nine Worlds'. And within this cosmological reality, as the myths repeatedly illustrate, there always has been from the very beginning, and always will be for ever and ever, conflict, a conflict of opposing forces, embracing the entire cosmos, ourselves included, which the myths portray in terms of the struggle of the Æsir against the giants, that is to say of the forces of Nature, order, life and creativity against the opposing forces of dissolution, disorder, disintegration and destruction. In this cosmic conflict each man and woman must choose his side and play his part, for or against the Æsir. This is the inner meaning of our lives. ... AND OF ODINIST ETHICS? Odinism is an ethical religion. If we are true Odinists who embrace the cause of the Æsir, then it follows that we should act in a way which promotes and respects Nature, order, life and creativity, while eschewing harmful and destructive behaviour that threatens the well-being of the folk, faith and family. Odinists place great emphasis on the concept of personal freedom (and therefore repudiate all forms of totalitarianism), but accept the corollary of the necessity of a common law for the common good. Odinist ethics are not expressed in terms of prohibitions and commandments, but in terms of the positive virtues which all Odinists should aspire to practise. We call these the 'Nine Noble Virtues': Courage, Truth, Honour, Fidelity, Discipline, Hospitality, Industriousness, Self-reliance and Perseverance. It is a well-known fact that the most widespread form of communal worship practised in ancient times by pagans of every nationality was the sacrifice. Sometimes farmyard animals would be sacrificed; sometimes it would be other agricultural produce, like grain, corn or fruit; sometimes a libation would be made by pouring liquor or oil on to the earth; sometimes treasure or weaponry would be sacrificially buried or submerged. Regardless of the form it took, the sacrifice was understood as the offering of a gift to the gods, in order to win their goodwill and to be rewarded, in turn, by their bountiful favour. The essence of the sacrifice is that something of value, some item of personal wealth, is given up, given away, consumed, destroyed or immolated. Of course, intelligent heathens always recognised that the sacrifice is symbolic: the gods are spiritual beings, and are therefore not physically fed by the food and drink offered to them; they cannot be materially enriched by our gifts of silver and gold. As with all gifts, 'it is the thought that counts'; it is the devotion shown by the worshipper, to which the gods attribute merit, and to which they respond with generosity, in accordance with the heathen maxim of 'a gift for a gift', one gift deserving another in return. ... AND OF HEATHEN MAGIC? The heathen sacrifice can be described theologically as a 'sacrament' (a term originally borrowed from pagan usage by Christian polemicists), that is to say, it is a symbol which effects what it symbolises, and symbolises what it effects. The sacrifice plays an important role in the cosmic conflict between the forces of order and chaos, because the symbolism of ritually offering riches or life-giving sustenance to the gods actually brings what is symbolically portrayed into effect on the spiritual plane, thereby strengthening the gods' hand in their eternal struggle against the powers of chaos. Just as the sacrifices of the battle-slain heroes, the Einheriar, add to the forces of Odin in Valhalla, so too the blood spilt, physically or figuratively, in the celebration of ritual sacrifices reinforces the power of the gods to maintain the order of Nature - and thus directly benefits human society also. In the sense that 'magic' may be defined as a means of affecting the course of events in the natural world, or the course of human lives, through the invocation of spiritual forces, pagans, persuaded that the sacrifice is an extremely effective means of bringing about positive change in the world, and of achieving desirable ends through the workings of divine power, have always held it to be a truly magical operation, as much as an act of religious devotion and duty. Magic is not, as foolish folk argue, a means of changing the world through the exercise of the human will; it is through the exercise of divine power in co-operation with human action, that magic works. WHAT SORT OF RITES DO ODINISTS PRACTISE TODAY? Odinists in modern times do not practise elaborate rituals, such as animal sacrifices, that were common in olden days; it would be neither legal nor necessary to do so. What is necessary is that we understand the theological principles that underlie ancient practice, and apply those principles in forms better suited to contemporary conditions. For this reason, the form of sacrifice practised by modern Odinists is the libation of mead, accounts of which have been recorded in the literature. It was known in ancient times as the Cup of Remembrance: a drinking horn filled with mead, a beverage associated in the myths with inspiration and poetry, which is also said to be the favoured drink of the Einheriar in Valhalla, is consecrated by the priest or priestess; some of the mead is then sacrificed to the gods with prayers and petitions, by being poured out on to the earth (or into a trygill containing soil, if it is an indoor celebration); then the horn is passed round among the priest and people for each to sup of the remnants in turn, adding, if they so wish, personal petitions or pledges of their own. WHAT RELIGIOUS FESTIVALS DO ODINISTS OBSERVE? There never was in ancient times one universally observed calendar of holy days, for the religious festivals celebrated by our forefathers varied according to time and place. The calendar in use by Odinists in this country today is based on some of the festivals most widely celebrated by our ancestors, especially those which have survived as part of our people's folklore. Many church festivals have incorporated elements of heathen customs; and it is now our task to 're-paganise' them. There are six major feast days. Four mark turning points in the cycle of the natural year; these are the solstices and equinoxes, or quarter-days, of Yule, Easter (named after Ostara, the goddess of Spring), Midsummer's Day and the Harvest Festival. Odinists meet on the eve of these quarter-days to share the Cup of Remembrance. The two other feast days, on which Odinists gather for worship, are the national festivals of Sigurd's Day (23rd April) and Heroes' Day or Einheriar (11th November). The former commemorates England's patron, Sigurd the dragon-slayer, on whom the legend of St. George is based. The latter is a solemn occasion during what our forefathers named the 'month of sacrifices', when they made oblations in honour of their dead. Yule and Midsummer are High Holidays, and Odinists are encouraged to observe them as public holidays dedicated to relaxation and merry-making with family and friends. WHAT OTHER RELIGIOUS RITES ARE THERE? New-born babes receive their name, and are deemed to become members of the community, in a religious Naming ceremony, in which water is poured over the infant, in accordance with an old, heathen custom, prevalent in northern lands long before the introduction of Christianity. The Handfasting or Wedding ceremony is the occasion for the exchange of solemn vows, which the couple make while, together, holding the altar oath-ring in their hands; the finger-rings they exchange serve as a reminder of this act. Then the Thor's Hammer is laid upon the bride and groom by way of blessing. Odinists hold the ties of marriage and family relationships to be sacred; therefore adultery is strongly condemned as an act of oath-breaking; divorce is discouraged, but may take place if it has the consent of both parties. Odinists believe in paying kind heed to the dead. The Laying to Rest may take the form either of burial or of cremation. WHAT RITES OF INITIATION ARE THERE? The ceremony whereby an Odinist, who has attained the age of majority, solemnly and formally makes a public declaration of his beliefs is the Pledge of Faith. The priest proffers the oath-ring, which the aspirant grasps, while repeating these words: 'I pledge myself and swear, before our holy gods, true loyalty and fidelity to Odin Allfather, to the Æsir and the Vanir, and to the faith of my forefathers, and to none other, for as long as I shall live, so help me, Odin and all the gods of Asgarth.' An oath-ring is to be found on every Odinist altar, and when an oath is sworn upon it, the gods themselves act as witnesses. Odinists are renowned as men and women who respect their oaths. Oath-breakers, like cold-blooded murderers, are deemed outcasts before gods and men. IS THERE AN ODINIST PRIESTHOOD? Odinists subscribe to the principle of the 'priesthood of all believers', insofar as any adult Odinist, male or female, who has made the Pledge of Faith, may lead a congregation or perform priestly duties without any further act of ordination, provided that he enjoys the confidence of his fellow Odinists. Likewise, in cases of necessity, any Odinist may celebrate the sacrifice of the Remembrance Cup. Of course, in practice, not every Odinist is willing or able to assume a position of leadership within the Fellowship. Women, in ancient times, frequently held sacerdotal or religious positions in paganism; and all priestly functions within Odinism are open to women, as much as to men. In a religion like Odinism, in which the goddesses hold a place of equal honour with the gods, there can be no justification for discouraging women from assuming a prominent role in the Fellowship and playing their part as Odinist priestesses. WHAT PLACES OF WORSHIP DO ODINISTS HAVE? Some of the noblest monuments of Europe, such as the Acropolis and the Pantheon, were constructed as pagan temples, and in heathen days of yore Odinists built and frequented innumerable temples for the celebration of their rituals, many of them humble, wooden structures, some of them grandiose, stone-built edifices like that at Uppsala in Sweden. There are more than two hundred references to Odinist temples in the literature. One of the key aims of the Odinist restoration is to institute a network of temples in every county, and in every major town and city up and down the land. However ambitious this long-term project may seem, it remains an indispensable precondition for the revitalisation of the faith. We are still living in the early days of the Odinist restoration, and for want of a local temple, Odinists must, perforce, meet in house groups, which we call 'Hearths'. National and regional 'Gatherings' are also organised, from time to time, to enable isolated Odinists to maintain contact with their fellows. Odinists also often like to hold outdoor ceremonies at places of special spiritual or historical significance, or at sites of outstanding, natural beauty. DO ODINISTS HAVE ANY SACRED TEXTS? There is, in the Odinist religion, no equivalent to the Bible or the Koran, no holy writ of allegedly divine inspiration, laying down the law for all to obey. Nevertheless, Odinists pay special heed to texts, known collectively as the Eddas, which, though certainly of human authorship, provide us with our most important primary sources of information on the old religion, and its theology, mythology and cosmology. The Eddas do, indeed, contain contradictions and, no doubt, errors, and they must be examined critically and objectively, taking full account of the historical circumstances of their composition, for, like all human literature, they are the product of their era and environment. The importance of the Eddas to the contemporary revival of Odinism, however, is self-evident, for how else could an ancient form of religion be restored, except by reference to sources of historical information, such as they provide us with? Therefore, no literate Odinist should fail to devote time to their study. WHAT OTHER PRIMARY SOURCES ARE THERE? Of course, there are other sources too. The Icelandic Sagas and Snorri Sturluson's 'Heimskringla', a history of Norway, provide us with many details about ancient Odinism. Important to are Saxo Grammaticus's Latin work, 'Gesta Danorum', and the medieval German 'Song of the Nibelungs'. Various Old English works, like 'Beowulf' and 'The Nine Herbs Charm', as well as the Old High German 'Merseburg Charms', cast light on the old religion, as do various other literary sources, such as the English, Norwegian and Icelandic rune poems, Tacitus's 'Germania', Bede's 'Ecclesiastical History of the English Nation', and the German 'Wayland-Dietrich Saga'. Besides the literature, the modern Odinist revival takes account of a vast array of archaeological records and finds. Methods of comparative Indo-European religious studies and, likewise, aspects of modern psychology add to our understanding of the faith of our ancestors. And we are, indeed, indebted to the research and analyses of academic scholarship in collating and interpreting all of these data. But, when all is said and done, it is above all on the Eddas that we must rely for our historical knowledge of Odinist beliefs. The Eddas actually comprise two entirely separate works, namely the Elder Edda (also known as the Poetic Edda, and sometimes as Saemund's Edda) and the Younger Edda (often called the Prose Edda or Snorri's Edda). Both were set down in writing, in their current form, in 13th century Iceland. The novice is best advised to start with the Younger Edda. This was composed by Snorri Sturluson, not as a work of religion, - it was, after all, written over two hundred years after the conversion of Iceland to Christianity - but as a manual of poetics, the author's aim being to keep alive the traditional style of poetry for which Iceland had become renowned. This skaldic poetry relied on the use of complex metaphors and allusions to the old heathen myths. So, to explain these, Snorri sets out in a systematic and quasi-chronological fashion as much of the corpus of Odinic mythology as his research could uncover, thereby - unwittingly - providing us moderns with the most coherent overview of it we could hope for. Of course, Snorri, although sympathetic to Odinic lore as Iceland's national heritage, was not an Odinist believer; therefore, some things he misunderstands, and some things he tries to explain away or rationalise in accordance with the tenets of the Church and the ideas of his time. Odinists must therefore adopt a balanced and discriminating approach to this vital treasury of knowledge on the elder faith. The Elder Edda is an anonymous collection of Odinist poetry, including texts such as 'Hávamál' ('The Sayings of the High One') and 'Voluspá' ('The Seeress's Prophecy'). Though it was compiled in the 13th century, many of its constituent poems are much older, and some of the texts may go back as far as the 9th century. Even then, the lore contained in them derives, in large measure, from the proto-Germanic period. The Elder Edda has both the advantages and disadvantages of poetry: its meaning is frequently obscure and uncertain, but it often succeeds in conveying the true mood of the elder heathen faith far more forcefully and emotively than the Prose Edda does. On the other hand, because it is fragmentary in character, we are often reliant on the Younger Edda to provide a fuller context for the mythic incidents it relates. Even in the case of the Elder Edda, though so much of its material undoubtedly pre-dates Christianity, we find instances of Christian influence and, indeed, some poems, e.g. 'Lokasenna' (Loki's Flyting'), which may have been written from an anti-Odinist standpoint. Vital and inspiring, as the Eddas undoubtedly are, we should not rely on them as unquestionable authorities, in the way Christians rely on the Bible, or Muslims on the Koran. Instead, Odinists need to exercise the noble virtue of self-reliance in appraising the Eddas critically, intelligently and objectively. DO ODINISTS ACTUALLY BELIEVE IN THE EDDAIC MYTHS? The myths are myths, and were never intended to be read as a history of actual chronological events. We do not believe in the myths, as such, but in the High Gods of Asgarth, about whom the myths instruct us; and we believe in the spiritual truths the myths expound. Some of the myths relate to natural phenomena, such as the cycle of the changing seasons. This is the case with the myth that tells of the death of Balder, the sun god: Balder, the Shining One, is slain by his blind brother, Hother, to the unutterable grief of all the gods and goddesses; yet, in due course, Balder returns to rule the Earth anew. We can apply many levels of interpretation to such a myth. It may signify the succession of day, night, day; or of summer, winter, summer. It may also refer to the succession of ages, whereby the ancient traditions are eclipsed for a while, only to resume their former glory in the latter days. And it may also speak of the fate of the human soul and the cycle of birth, life, death and rebirth. Many of the myths describe conflicts between the gods and the giants. They are meant to present profound, spiritual truths in an entertaining and amusing format. These stories show the Æsir to be neither absolutely powerful, - for their enemies often place them in extreme jeopardy - nor absolutely virtuous, - for they are sometimes forced to resort to deceit and trickery in their dealings with the giants; - but that should not obscure the fact that the cause, for which the gods are fighting and scheming, is to preserve the cosmos and to sustain the natural order against the forces of chaos and dissolution. The gods’ is a holy cause, and it is our cause too! ARE THE GODS REALLY AS THE EDDAS PORTRAY THEM? In the Eddas the gods and goddesses are depicted anthropomorphically: Thor as a brawny man sporting a red beard, Freya as a beautiful woman wearing a resplendent necklace, Odin as an old, hooded greybeard, and so forth; and all of them are portrayed as if engaged in physical activities like eating and drinking, playing and fighting. Yet the Æsir are gods, not men; and they do not truly possess bodies, parts or physical attributes, because they are divine spirits. Intelligent heathens always recognised this truth. Why then did our forefathers, in recounting the myths, depict the gods as if they were merely human, albeit on a grander scale? Why did the artists and sculptors of ancient times represent them with given physical attributes in the images and statues they made to adorn the temples? The reason is that mankind is so entrenched in the physical, material world about us, that our human minds find it difficult to grasp spiritual truths, and we need to express these truths in homely and familiar terms, which have a direct and immediate impact on our senses. Man's artistic creativity is a natural talent, and we find it helpful to use images of our own making to focus our thoughts and feelings about the gods. In the same way, we naturally tend to give physical expression to our prayers and invocations, which accounts for our use of ritual. Every detail of the gods' physical descriptions recorded in the myths, and each of the deeds related about them, are indicators of an underlying spiritual truth. The imagery of the myths is our way of translating those spiritual truths into human language. IS ODINISM AN ESOTERIC RELIGION? WHAT CAN YOU TELL US ABOUT THE RUNES? Odinism is neither occult, a word which means 'obscure' or 'hidden', nor esoteric, meaning 'reserved for a small elite'. Like all forms of historical paganism, Odinism was always the common property of farmers and peasants, soldiers and sailors, housewives and fishwives. Odinism is for all our folk. Even the magical operation of the sacrifice is accessible to every Odinist, for, after all, magic and sacrifice are but extensions of prayer, or prayer in action, as it were; and prayer is available to all. However, there is one aspect of Odinic lore that can indeed be described as esoteric: the runes. In fact, the word 'rune' means 'secret' or 'whisper'. How ironic then, that the one aspect of the faith, meant to be whispered in secret, has become the subject of so many cheap publications. Can their authors understand what the word 'rune' means, even, if they broadcast their runic speculations so? We do not intend to follow their example! Our forefathers held the runes to be Odin's gift to his folk, the People of Odin. They certainly used them for oracular purposes and in charms and spells, but such magic could only work, because they invoked and believed in the gods and in the Norns, the goddesses of fate, and attributed to them alone the powers that were channelled through the runes. Without a thorough knowledge of Odinic lore, the runes cannot be interpreted correctly; and without faith in the Norns, how can the Norns be invoked through the runes? In short, you can have an Odinist faith without the runes, but you cannot have the runes without the Odinist faith. IS ODINISM A MISSIONARY RELIGION? Odinists do actively seek to propagate a knowledge and awareness of their beliefs among their fellow-countrymen, by publishing literature, holding open meetings, and the like. We believe that our faith is for all the folk, the common spiritual and cultural heritage of believers and non-believers alike. We, naturally, wish to see Odinism grow, and we welcome new recruits. However, we do not proselytise by seeking to win converts from adherents of other religions, as we believe that every individual has the freedom to make his own choice in matters of faith, and that that choice should be respected. Odinists strongly disapprove of the way Christians and Muslims have engaged in missionary work among less developed peoples, undermining their traditional customs and way of life, while imposing upon them alien moral and cultural standards, much in the same way as the Church acted towards the heathen English during the conversion period. Odinists do not desire to convert the whole world to Odinism, because, whereas paganism is universal, the Odinist form of paganism is ethnospecific. Indeed, were we to receive a request to administer the Odinist Pledge of Faith to, say, a Japanese or a Nigerian, we would encourage that person to embrace his indigenous form of heathenism, because heathens of all nations believe in being true to oneself and to one's ancestors. WHAT IS THE SIGNIFICANCE OF THOR'S HAMMER? 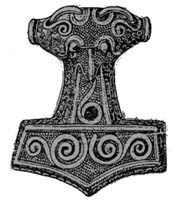 Every religion has its emblem or symbolic device, and that of Odinism is the Thor's Hammer (depicted below). The Eddas give it the name of Miollnir i.e. the 'Crusher' or 'Grinder'. Forged of iron by the dwarves, this short-shafted hammer possesses the magical characteristic of always returning, boomerang-fashion, to its owner's hands after being thrown. Time and again, Thor uses this magic weapon to fateful effect in settling his endless quarrels with the giants and the other foes of Asgarth, thereby proving himself to be the great and valiant protector of gods and men alike. From the literature we can see that Odinists in ancient times incorporated this symbol into their liturgies, using representations of it to hallow new-bom children, to bless wedded couples and to sanctify the funeral pyres of the dead. We also read of the sign of the Hammer being used to consecrate libations offered to the gods; and it was frequently worn as an amulet or pendant, many such finds having been discovered by archaeologists. It is, above all, a sign of divine protection and hallowing, by which we demonstrate that we have become allies of the Æsir in their struggle against the forces of chaos. Odinists also nowadays often sign themselves with the sign of the Hammer in the course of celebrating their rituals. This is done by clenching the right hand in a fist (indicating strength and determination), raising it to the forehead, and then tracing the sign of Miollnir, in the shape of an upside-down 'T', by moving the fist, first, to the sternum, the mid-point of the chest, and then to right breast, and then to the left breast, while reciting the words: 'In the name of the Æsir: and of the Vanir: and of all the Powers: of Asgarth.' The symbolism of this action can be explained as follows: Showing strength and determination, I shall honour the gods with all my mind (indicated by the forehead) and with all my heart (the sternum), from the rising of the sun (that is, from my earliest years), which is indicated by the East (i.e. the right-hand side, when facing towards the sacred point of the North), until the setting of the sun (that is, until my dying day), which is indicated by the West to the left. For further reading, all of the following are recommended. Asterisked entries are still in print; if your local bookshop cannot obtain them, they can be ordered through Dillon's of Gower Street, London (tel: 0207 636 1577).